The beautiful cashmere knit I am wearing today was a gift sent to me by an amazing brand that I have been coveting for a while, so you can imagine my excitement when they got in touch to see if I would like to choose something. Very spoilt indeed. I am also a little obsessed with the brand’s beautiful instagram feed. Madeleine Thompson is half British and half Chinese and grew up living between Hong Kong and London. The brand reflects these different worlds with California thrown into the mix, where the campaign imagery and much of the inspiration comes from. Madeleine says ‘I want the women who wear my clothes to feel elegant and relaxed’ and wearing this jumper makes me feel just that. Relaxed, cosy and elegant. Choosing something wasn’t easy, as her designs are all so unique and eye-catching, but in the end I went for this design because it was a little bit different to my usual style of knitwear. 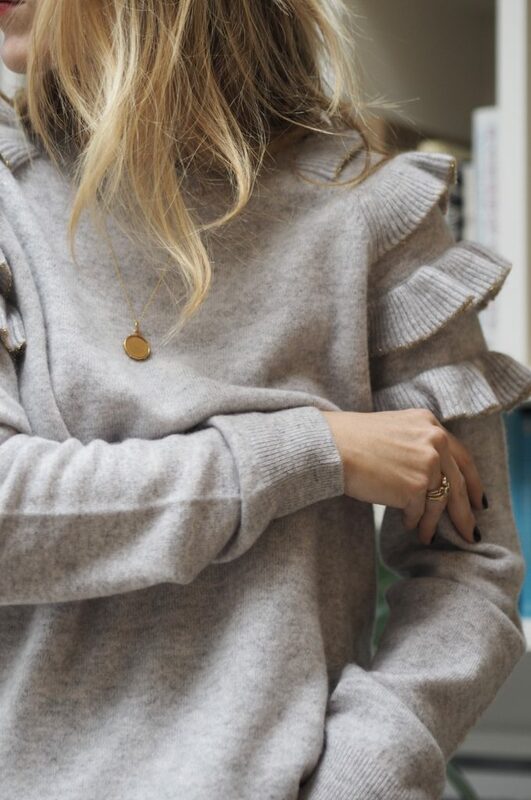 I have always avoided anything with ruffles across my chest, but I do love a sleeve ruffle. And as we still have a few months of winter ahead of us, (sorry!) I thought I would have a look at some similar styles for you, in case you’re partial to a ruffle and in need of a new knit.